Hair loss is an unfortunate and often distressing symptom of menopause. When a woman is in her forties and early fifties, her body alters its hormone production in preparation for menopause. Imbalances of estrogen, progesterone, and testosterone can impair healthy hair growth and cause hair to become thin, brittle, or fall out in patches. 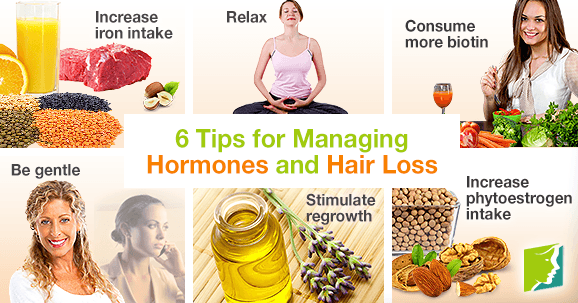 While there is currently no cure for thinning hair during menopause, hormonal hair loss can be controlled with a few adjustments to your diet and habits. The primary function of iron is to carry oxygen in the bloodstream and maintain healthy red blood cells and blood circulation. Increasing your intake of iron by eating more red meat, poultry, nuts, seeds, and legumes will boost circulation to the scalp, which can stimulate hair growth. Drink a glass of orange juice or lemonade with foods high in iron, as vitamin C maximizes iron absorption in the body. Stress can exacerbate hair loss, so looking for ways to relax can help minimize this symptom. You might try taking up yoga, meditation, or enjoying peaceful walks - any activities that help you to escape from the stresses of daily life. Biotin is a mineral that has been linked to hair growth. You can increase your intake of biotin by incorporating more lettuce, chard, carrots, and tomatoes into your diet. It's important to take care of your hair to avoid exacerbating hair loss. Try not to twist it into tight styles, avoid chemical treatments, and don't use heat styling products, as these damage the hair and weaken the follicles. Stimulate regrowth by gently massaging essential oils into your scalp on a daily basis. Lavender oil has been found to stimulate hair regrowth when applied topically, and it's a stress-relieving herb, too. The massaging motion will also increase blood circulation to the scalp, encouraging activity in the hair follicles. Soybeans, nuts, and seeds all contain phytoestrogenic compounds that act like the body's own estrogen. Increasing your phytoestrogen intake could help counteract the perimenopausal hormone imbalances that contribute to hair loss, thereby reducing or alleviating the symptom. Though hair loss during menopause is undeniably upsetting, try not to focus your energy on negative emotions, as stress can easily exacerbate the symptom. Concentrate on managing your hormone levels and hair loss with recommended lifestyle choices and try to keep a positive attitude. Be good to yourself and explore other sources of body confidence. This might mean trying a new style of clothing or accentuating your eyes, lips, or another part of your body you are proud of. This will help you feel and look good as you work on balancing your hormones and improving your health.